February | 2017 | Ellsworth AFB Volunteers! Are you looking for a group opportunity? Volunteer at the Hope Center! One of the best ways for groups to volunteer at the HOPE Center is through service projects. Previous service projects have involved cleaning, painting, washing windows, landscaping, building shelving, and assembling hygiene kits. Your group can even develop your own service project specifically for the HOPE Center. Tours and a question and answer session are available to groups doing service projects. Service projects are available for all ages. Youth in Science, Rapid City (YISRC) and the Women in Science and Engineering (WiSE) group from SDSM&T are calling for volunteers to help at our annual Women in Science Conference, a one-day conference from 7 a.m. to 3 p.m. March 7, at the SDSM&T campus. Their focus is to provide an introduction for Middle and High School girls to a variety of careers in Science, Technology, Engineering and Math (STEM) fields. This fun, information filled event has experienced huge success with over 500 girls from all over the region attending in 2016! This year we have registered over 750 girls. All aspects of the conference are made possible through community volunteers and donations. YISRC and WiSE invite you to join us. Building monitors, Group leaders, IT support and Registration help needed. For more information, call 605-484-2076. Breast Cancer Survivor? Please consider becoming a patient mentor. The American Cancer Society is looking for women who have had breast cancer (one year post treatment) who want to be mentors to other women who are facing a diagnosis, diagnosed or going through treatment. The volunteer will guide the patient through every step of their breast cancer experience. Training available. For more information, call (605) 361-8277. Can you help with the Mobile Food Pantry? The Mobile Food Pantry, a collaborative between Feeding South Dakota and the General Beadle Community School, seeks five volunteers to help with the Mobile Food Pantry. Volunteers will help with bagging and distributing food. Lifeline Connection of the Black Hills will hold a Facilitator Training March 3-4. Training will be 5 p.m. to 9 p.m. Friday, March 3, and 8:30 a.m. to 4:30 p.m. Saturday, March 4, at First Assembly of God Church. There will be a light dinner served March 3 and a light breakfast and lunch served March 4. The facilitator trainers lead Christ-centered recovery groups in the community and corrections facilities. Volunteer facilitators will deliver a non-residential, Christ- centered curriculum, teaching participants how to overcome life- controlling issues by applying Biblical standards from God’s Word to all aspects of their lives, including employment, church, and community. For more information, call (605) 791-0394. Would you enjoy interacting with children ages 2-4 years and know you are helping them learn to stay safe at the same time? A double win!! Thanks to a collaboration between the Rapid City Public Library and the Rapid City Fire Department, RCFD Fire Corps volunteers from 18 to 81 can be part of the Book Buddies Story Time at the library’s main building from 9:30 a.m. to 10:00 a.m. on the first Tuesday of every month. The best part is that not only will there be fun books to read and games to play, but the kids and their accompanying parents (and maybe the volunteers!) will learn more about fire and personal safety! Just think: how often can you have all the fun of reading to and playing with youngsters and help them learn to be safe, too? An orientation, training, materials, and mentoring are only part of what volunteers will get from Fire Corps, along with high fives and hugs from the kids! For more information on this and other RCFD Fire Corps opportunities, please call Lisa Saunders at 605-394-5233. Center from 12:00 – 6:00 pm. 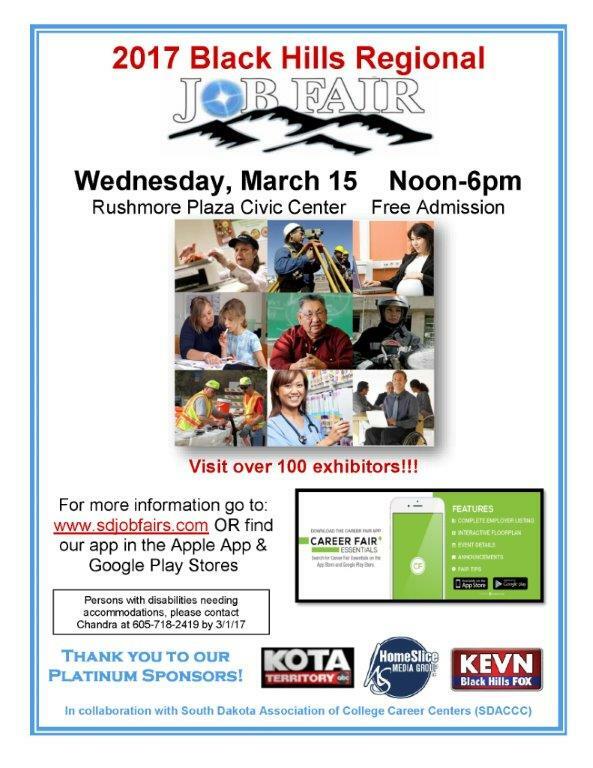 There will be over 100 exhibitors and about 1000 candidates who come.